Article: "Carnegie Foundation Calls for 'Radical Transformation' of Nursing Education"
A few years ago, faculty and school leaders at the Nell Hodgson Woodruff School of Nursing agreed that fundamental changes in the nursing curriculum were needed to better prepare students as clinical leaders in today's highly complex health care environment. Those changes now permeate how BSN and MSN students learn every day. The impetus for reshaping the curriculum dates back to 2009, when the Carnegie Foundation for the Advancement of Teaching published Educating Nurses: A Call for Radical Transformation. The study called for dramatically changing how nurses are trained to practice at the nexus of team-based clinical care, diverse patient populations, science and technology, and health systems financing. Also, in 2010, the Patient Protection and Affordable Care Act became law, and the Institute of Medicine report on The Future of Nursing: Leading Change, Advancing Health was published, further accelerating the need to reshape nursing education. Carolyn Clevenger 02MN DNP GNP-BC AGPCNP-BC FAANP remembers how Emory's nursing curriculum was turned upside down starting in 2010. "The way we care for patients and our health care systems were changing," says Clevenger, assistant dean for MSN education. "We needed to look at how we use electronic medical record data, how we protect patients, how we expand access. All of those things were coming together to change our health systems and the way health care is delivered. The way we prepare nurses to function in those systems had to be different." Faculty, clinical instructors, school leaders, and other stakeholders thus came together to reimagine a new MSN curriculum, implemented in fall 2012, and a new BSN curriculum, implemented in fall 2015. When Emory nursing faculty are asked what's the biggest change in the graduate curriculum today, they answer unanimously "clinical blocks." Gone is the old routine of advanced practice students spending one or two days a week in clinicals. Now they spend two to four weeks in clinical practice at a time, in between several weeks of classroom time and simulation training. "The clinical blocks provide more structure for students and preceptors and better continuity of care for their patients," says Elizabeth Downes 04MPH DNP RN CNE FAANP ANEF, a former curriculum committee co-chair. "Students are able to follow patients through the entire process of care planning and delivery, ordering and getting back lab results, and discharge planning." Woven into both the MSN and BSN curricula is a series of core courses covering the care continuum across the lifespan. Courses include optimal wellness (which also addresses self-care of nurses), management of acute and chronic illness, mental health (covering topics such as anxiety, eating disorders, and dementia in the general population), and palliative care. The palliative care course, curriculum planners say, is a new addition that few if any other nursing schools offer. It covers weighty topics such as when to initiate hospice care, how to make difficult decisions, and how to have difficult conversations, whether the patient is a pregnant woman with fetal demise, an infant in the neonatal ICU, a child or young adult with cancer, or an elderly patient requiring nursing home care. "The redesign of the MSN curriculum was driven by the need to address the increased demands that nurse practitioners face in terms of providing holistic care," says Downes. "So many of our patients tend to be older and sicker, often with more than one condition, so our curriculum needed to address that more thoroughly." 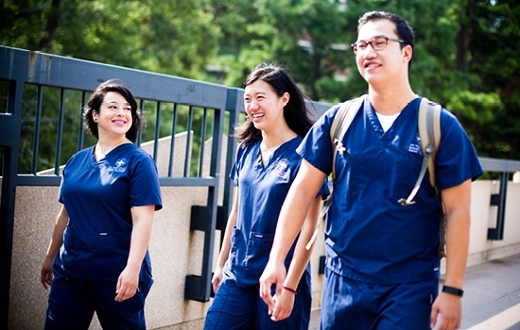 Curriculum planners also sought input from those who hire Emory-trained advanced practice nurses (APRNs)—employers like Emory Healthcare, the Atlanta VA Medical Center, Children's Healthcare of Atlanta, WellStar Health System, and Northside Hospital, to name a few. "Our stakeholders told us that their nurses need to be able to see patients across the continuum," Clevenger says. "They felt that APRNs needed to clearly understand their role, how to perform basic procedures (i.e., suturing and draining wounds), how to evaluate the quality of care they provide, how to improve care and measure it, and how health providers are paid." When the time came to revise the BSN curriculum, new courses were added and old courses and theories revamped to better prepare nurse generalists to lead in the multi-faceted health care arena. "We have to look at health care differently today," says Angela Amar PhD RN FAAN, assistant dean for BSN education. "There are more technological advances, more scientific advances, more drugs, more everything. People are living longer. We're saving babies earlier. The curriculum needs to prepare students to manage all of those pieces." During their first semester, BSN students are introduced to the public health and community aspects of nursing in a new course on population health. Courses on mental health nursing and palliative care and difficult conversations are now integral to the BSN curriculum. In their last semester, BSN students take an ambulatory care course, another addition to the curriculum. "Projections show that nurses of the future will work more outside of the acute care hospital setting," says Amar. "That makes sense because patients manage most of their illnesses outside of the hospital. The ambulatory care course gives us a place for students to interact outside the hospital in clinics, same-day surgery centers, and infusion centers. They learn about care coordination, which dovetails with our population health course, where they learn that many people are at risk because they live in neighborhoods where it's unsafe to walk and without easy access to pharmacies and grocery stores with fresh foods." Additionally, the new BSN curriculum offers students more personalized learning options in the form of new electives—the EKG, critical care nursing, emergency room nursing, forensic nursing, and global aspects of birth, among them. 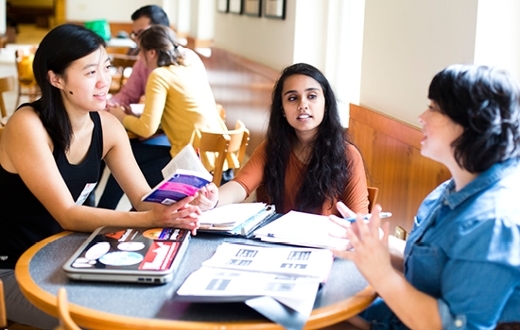 Students can take a deep dive in one of five areas—global health, policy and advocacy, research, leadership, and clinical nursing education—in the perspectives in professional nursing course. Students can also participate in a research honors program, which allows them to study a topic with a faculty mentor of their choosing. "We're such a strong research school that any student who wants to have a research experience should get one," says Amar. "Providing the mechanisms for helping them achieve that is important." Without question, simulation training and technology continue to impact how BSN students learn. They now spend more hours in the Charles F. and Peggy Evans Center for Caring Skills to enhance their hands-on and critical thinking skills. All use electronic medical record software for class assignments and clinical training. Also required is a smartphone app called Nursing Central, which serves as the reference tool for looking up drugs, tests, and diseases at the bedside. "It's important for them to know how to lead at the bedside to make sure that patients' needs are met and that they're seen as a valuable professional driving the actions of a team," says Amar. "Our students are prepared for that."